The manufacturing industry is quite complex. That’s because it involves intricate operations that require a close level of detail necessary to promote productivity and also maintain worker safety. That’s why it’s key to have proper communication systems in place. At Radio Communications of Virginia, we can provide the products you need to have consistent manufacturing success. Because technology is becoming more automated and advanced, manufacturers need to reinvent the way they create, operate, and innovate. According to a Motorola study, almost 45% of plant operators said that “clarity and coverage of communications” is their top challenge. That makes sense, considering how loud and chaotic a factory floor can be. If you don’t have a reliable communications system, it can compromise both security and operational efficiency. In order to have a thriving manufacturing operation, you need a way to effectively communicate with your employees, no matter where they are on the floor. Since these facilities are often very large, one of the best ways to facilitate communication is through the use of two-way radios. You also need to address any potential stalled production lines quickly. If there’s an equipment failure, from malfunctions or aging machines, then it could lead to expensive disruptions. The longer it takes for personnel to respond to issues and repair equipment, the more damaging the interruption can be. That’s another reason why two-radios can be very beneficial. By using real-time communication systems, you can help mitigate these risks. They can also allow you to be more proactive, relaying the right information to the right people. If you need instant communication among all your employees, then you may want to consider getting two-way radios. With the simple push of a button, you can distribute important information and direct tasks throughout your entire operation. This would eliminate errors that could interfere with production. For example, you may have a machine malfunction while trying to complete rush orders. If you have a digital two-way radio, you can get an instant alert that something is wrong. You can push-to-talk to maintenance to get the machine fixed and hear everything clearly over the loud background noises. Then, you can issue a work order ticket to maintenance, communicate the delay to the entire power plant, and request tools and parts needed for the repair—all from your digital radio. 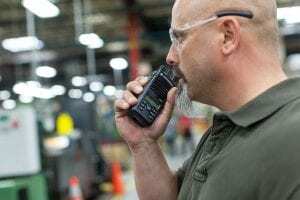 This is just one of the many ways that two-way radios from Motorola can be of great help to your manufacturing plant’s day-to-day operations. If you need high-quality two-way radios for your manufacturing operation, let the experts at Radio Communications of Virginia help. Don’t wait. Request a quote today! © 2019 Radio Communications of Virginia. All Rights Reserved. Design by Stream Companies Advertising Agency.